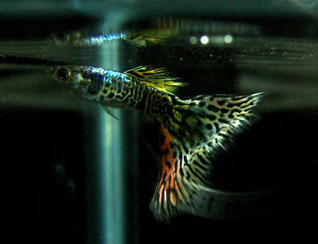 The pictures that you gonna see are of my prized Galaxies that I originally received from an American Guppy Breeder Frank Chang about 7 over years ago. I was enthralled when Frank told me that he still have some Galaxies to spare for me. Previously, he said that he had none to spare. U can just imagine how I felt when he agreed to sell these jewels to me. I received the gups in a styrofoam. 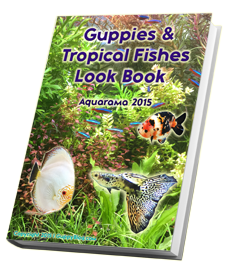 I couldn’t believe my eyes when the first ever shipment of guppies were in my hands. Slowly and carefully, I opened the box and saw a trio of the Galaxies in separate bags. One trio of guppies and 1 dead female. Sigh, I hope that I wouldn’t lose the other 2 and yes, from that 1 pair of Galaxies, I still have the strain in my setup, all alive and kicking…oops swimming. I cant recall, which generation of Galaxy I now have in my tanks. But if there are 4 broods per year, that adds up to 20 plus generations in my tanks and this is the 6th year I am keeping them. Wow. 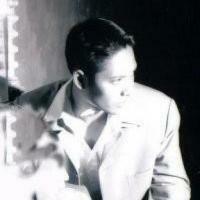 Something unthinkable 5 years ago. The pictures that I have posted are of Galaxies in the 5th generation. The above picture shows a Blue Galaxy. This is the result of me outcrossing this line with a Blue Grass Line, also from Frank. It is indeed a challenge to get Blue Galaxies and I gave up halfway as I did not have enough tanks. Now, however, I have decided to pursue this objective again. I am currently sourcing for a nice Blue Grass Hi Fin Line that might just help me to achieve a line of Blue Galaxies with a nice Blue colour and good finnage. This strain breeds true but somehow or rather, I had a line that threw out Japan Blues. Interesting right? I was shocked myself as I didnt expect Jap Blues to come out from Galaxies and guess what, I was even able to fix the Jap Blue line. I would talk more about the Jap Blue line in the next post. However, I have lost the line. 🙁 Nevertheless, it makes a nice story to tell you guys of the Jap Blue line and my experience keeping them. 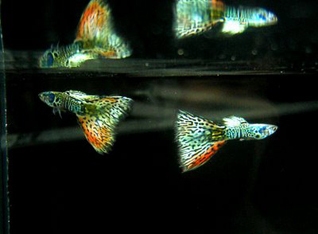 Maybe….just maybe, some of these fishes are still out there in the rooms of some breeders because I remembered some breeders managed to get these from me before the line died out on me. I will tell you guys more about these Galaxies of mine soon. do you know who derrick77 is ? He has a nice u tube video the shows some really nice purple moscow guppies. I would be interested in getting his email address as would like to contact this person to perhaps pucrhase some purple moscows from him. But I myself have lost his contact.